* 2nd Ability: After he moves, everything within 10 meters is stuck to the ground, including himself. Baron is a knife user. He has the ability to move to wherever his knife is when he throws it. His level two is to immobilize himself and his opponent to the ground if he teleports within one meter of the person. An honest and naive fellow and he always refers to himself in the third person in the Japanese version. This is toned down alittle but still existent in the Gainax dub. Baron is very loyal to Marilyn and can be quite gullible due to the fact that he is tricked by Ueki repeatedly. 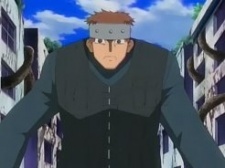 After a long fight in which Ueki discovers his own unique fighting style, Ueki temporarily takes him out with Masshu.